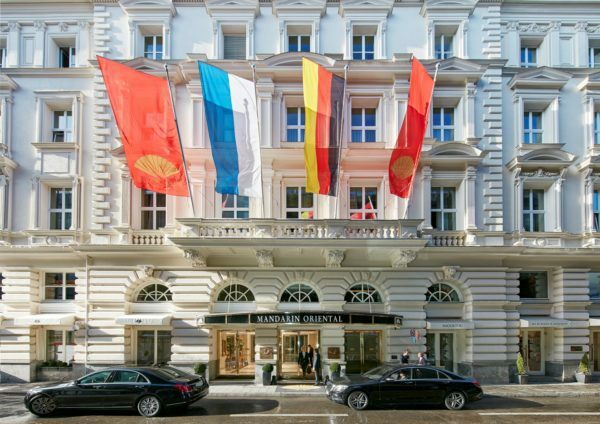 July 2018 – Mandarin Oriental, Munich is offering guests again the opportunity to experience Bavaria’s world-famous beer festival in style this autumn. Guests booking the Celebrate Oktoberfest Package will enjoy luxurious accommodation, Bavarian gourmet treats, an exclusive vintage bus ride from the hotel to the event, and much sought-after access to the famousSchützen-Festzelt tent. The package is available throughout the Oktoberfest period from 22 September to 7 October 2018. Dating back to 1810, the world’s biggest beer festival is a much-anticipated occasion on the Bavarian cultural calendar. By taking part in the celebrations, guests will enjoy some of Germany’s finest beers, all brewed in Munich, and sample traditional food, such as Schweinebraten (roast pork), Würstl (sausages), Brezn (pretzels) and Käsespätzle (cheese noodles). The Oktoberfest Package includes entry to the Schützen-Festzelt tent where locals, visitors and celebrities of all ages mingle and enjoy Bavarian specialities, while sitting together at long tables. One of the first tents to make an appearance at Oktoberfest, locally known as ‘Wiesn’, it is world-famous for serving a delicious pork dish prepared in an authentic Bavarian manner with malt beer sauce and potato-salad. Accompanied by their VIP host, guests will travel from the hotel to the festival aboard a vintage bus and be treated to delicious beer and giant Bavarian pretzels on the way. On arrival at the Oktoberfest, their VIP host will accompany them to their table in the Schützen-Festzelt tent. To start off their Oktoberfest celebrations, guests receive a selection of Bavarian gifts and delicacies in their room when they check-in at Mandarin Oriental, Munich. Treats include a gingerbread heart and 2018 Oktoberfest special edition mug, a collector’s favourite, created by the hotel. This package is valid for overnight stays from 22 September to 7 October 2018 and is subject to availability. Group offers are available on request. Reservations can be made online, by e-mail to momuc-reservation@mohg.com or telephone to +49 (0)89 29098 820.